The multiple-ligament injured knee is a devastating orthopedic injury that can result in long-term disability. Although the incidence within the military population has not been established, there are several reports describing the pathology and prognosis associated with these injuries in service members. The mechanisms are typically high-energy trauma, sports or training injury, or combat-related. 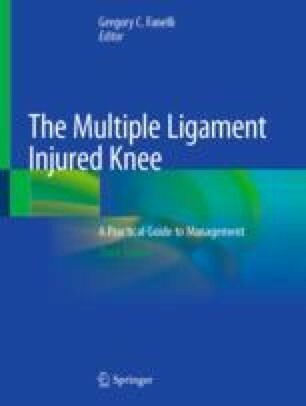 The principles of management of multiple-ligamentous knee injuries in the active-duty service member are similar to that in civilian trauma. However, combat-related multiple-ligament knee injuries have unique treatment considerations due to austere settings and combat mechanisms that result in complex extremity trauma and amputation. The goal for a soldier with a multiple-ligament knee injury is surgical reconstruction to restore stability and function to the extremity and to allow return to duty. As in civilian trauma, the challenge with multiple-ligament knee injuries is that treatment is dictated by the specific ligaments injured, the severity and constellation of associated injuries, and the performance requirements or expectations of the patient.